Shepherds on stilts represent the region of Bordeaux: a goose (foie gras) and a bottle of wine. They are the shepherds of the Chalosse, in the Landes, which is found in the region of Aquitaine. The land used to be so marshy, the shepherds could only get around on these wooden stilts. Des bergers sur échasses et ce qui représente la région de Bordeaux : une oie (foie gras) et une bouteille de vin. Ce sont des bergers de Chalosse dans les Landes, une partie de la région Aquitaine. La terre étant si marécageuse, les bergers ne pouvaient se déplacer que sur ces échasses en bois. That is asounding. If the land is marshy, surly something with such a small 'footprint' would get them more bogged. Yes, they are above the sludge, but how on earth do they progress? I would think those tennis snow shoes would be a safer bet. I agree with Julie. Anyway, this takes a lot of practice. What fun photos and well-composed. 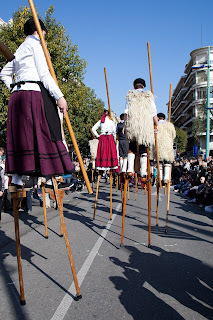 By the way, the shepherds of the Chalosse had another advantage with the stilts - they could see farther, keep track of the flock, watch for wolves. Also increased their speed over ground because of the extended stride. With those long staffs you see in the picture, their classic pose was like a camera tripod in fact. Thanks so much Anonymous (wish you'd at least write your first name or initials - I hate writing to a nameless person!) but very helpful information. thanks. This has me totally intruiged, Jilly. I have now examined all three of your images. The third stick is manipulated by hand. I guess this is to get them out of the mud and away from hazards as much as anything. I am so glad these folk are keeping this skill alive, because I would think it not an easy skill to learn except as a babe-at-knee. 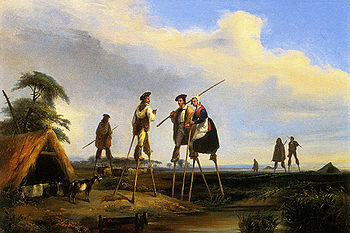 I've added a painting showing the farmers of the Landes on their stilts. What an earth-friendly way to solve the problem! This is much more romantic than turning a marsh into a landfill project. This fete is such a great way to showcase France and also the regions and traditions. 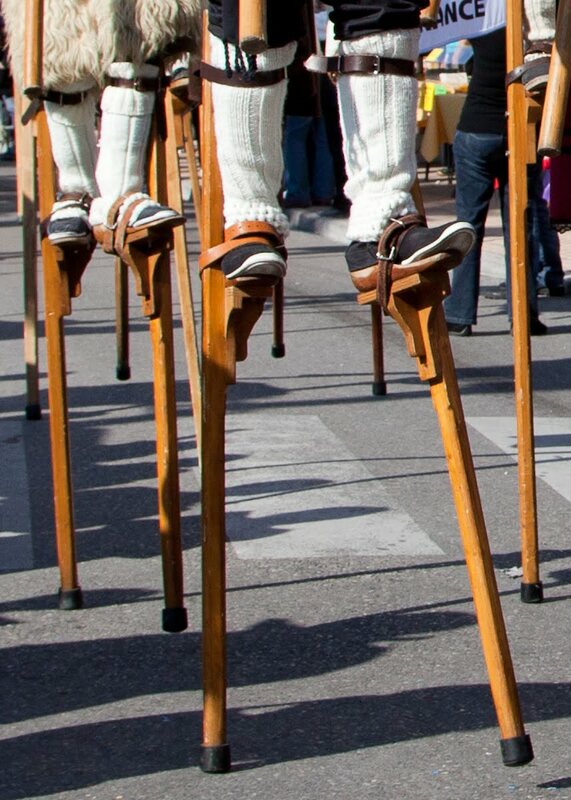 Those stilt walkers must be amazingly fit and have wonderful balance. Thanks so much for the visit Jilly. 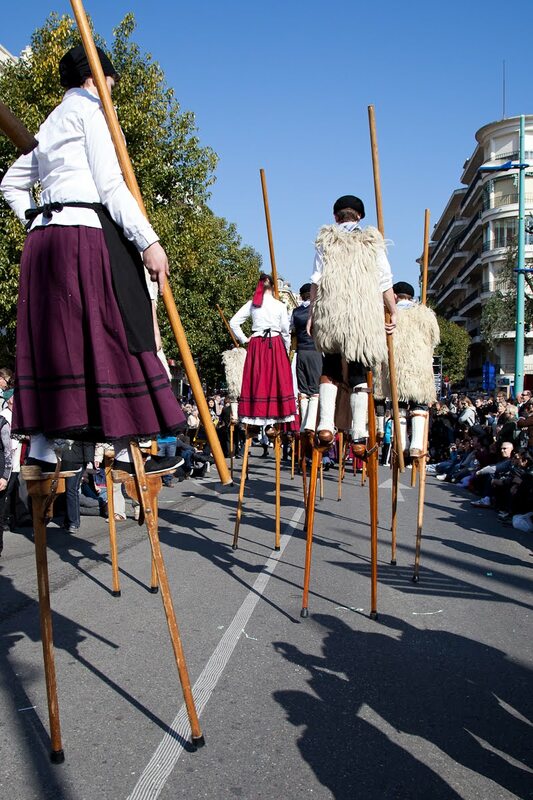 Shepherds on stilts. What's next, polo on sheep? Wonderful to remember traditions like this and it was so fabulous to see the paintings showing exactly how they were used in those times gone by. 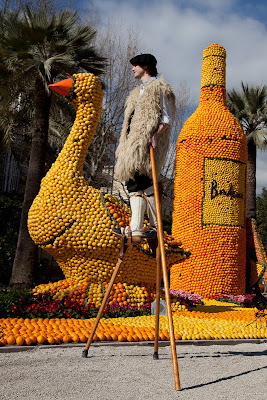 What an mind boggling amount of oranges must be used in this festival Jilly. Hopefully used to make the biggest fresh orange juice drink in the world! !